Love is expansive, inclusive and knows no bounds—whether it be race, color, gender, gender expression, age, ancestry, disability, marital status, sexual orientation, or military status, or if you are searching, seeking, or somewhere in between. We invite you to join us on a journey of discovery as we seek to love and serve God, each other, and all creation. Read more about Lent, which ends at sundown on April 20. 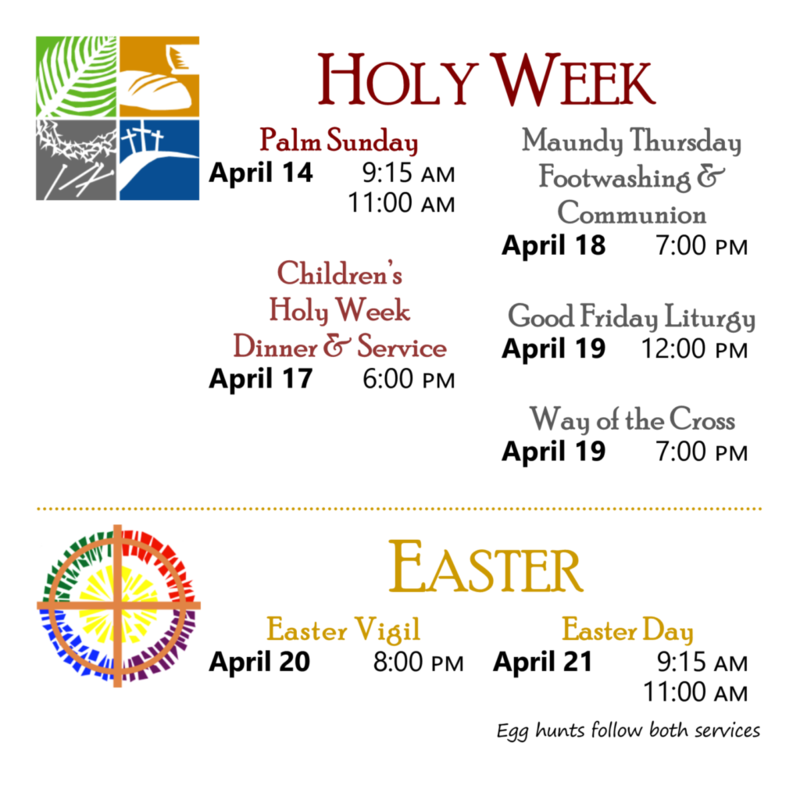 Read more about Holy Week and Easter services. Note: There is no 8:00 AM service on Easter Day. Proclaim the good news of the risen Christ! The choir, accompanied by organ, will sing Christ the Lord is risen again by Donald McCullough, Richard Proulx’s setting of Psalm 118, and Christ is arisen, a Serbian Orthodox melody arranged by Kevin Demetroff. 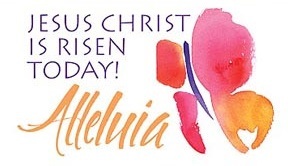 Festive hymns for congregation, choir, and organ include Jesus Christ is risen today; Good Christians all, rejoice and sing; and, The day of resurrection. Don your brightest, spring colors and bring some bells from home to ring during the service! and families are welcome to attend either service. Bring an egg basket from home; we have a limited supply of paper bags. Children are welcome in all of our liturgies. Nursery care for children 3 months to age 3 is available 9:00 AM—12:15 PM. Godly Play for children ages 3-10 is available 9:15-9:50 and 11:00-11:35 AM. Worship aids for children, such as activity bags, Action Bibles, books, and booster seats are available in the Narthex. Children serve in worship regularly as bread bearers, oblationers, acolytes, and lectors. 8:00 AM Holy Eucharist: A quiet, intimate, and reflective service of Holy Communion using the traditional liturgy of the Book of Common Prayer lasting 50 minutes. Coffee and fellowship follows. 9:15 AM Holy Eucharist: A relaxed, joyful, engaging, and sometimes intimate service of Holy Communion lasting about 50 minutes. The service uses expansive language texts taken from across the Anglican Communion. Music is both traditional and new, with leadership provided by an organist/pianist and vocal soloist. This service is accessible to both adults and children of all ages, and those who might be new to church or returning after time away. Come early or stay after for coffee and fellowship. 10:25 AM Adult Forum meets between the later services to allow learning and growing together. See the newsletter for upcoming topics and offerings. Youth Group meets on 2nd and 4th Sundays in the youth center, located in Bethany House. For more information on upcoming youth events and activities, contact us! 11:00 AM Holy Eucharist: An exuberant, festive, and uplifting service of Holy Communion lasting about 70 minutes. The service also uses expansive language texts taken from across the Anglican Communion and our own Book of Common Prayer. Music is primarily traditional and sometimes new, with leadership provided by the organist/choirmaster, cantor, and the Saint Michael’s Choir. This service is accessible to both adults and children of all ages, and those who might be new to church or returning after time away. Coffee and fellowship follows.